I’m Kristi from BeginNails and I’ll be guest posting for Kerry today while she is up exploring northern Minnesota. I was honored that she asked me to guest post and quickly said yes! Now lets get into the good stuff! I started with a 3 coat base of Spectre Flair to get complete opacity. I topped it with HK Girl Top Coat and made sure that was dry before continuing with my stamping. 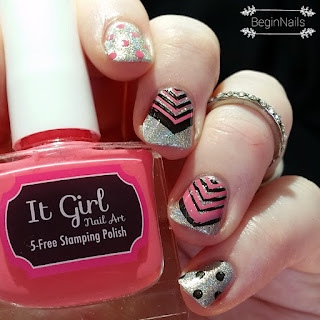 I protected my skin with Cuticle Cover and I decided to do a mix of stamping with Coral and Yoga Pants with the Shapely 02 Plate. 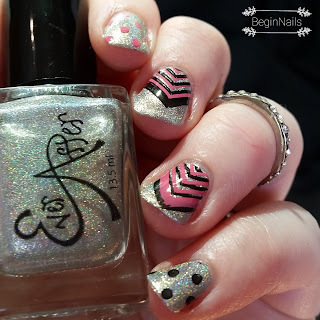 I rarely do manis that mix and match images and I always love how they turn out. I hope you did too! I hope you are enjoying your explorations Kerry! Don’t her nails look lovely? 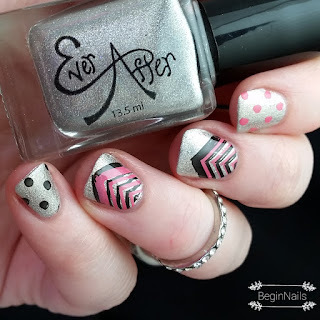 I’m loving the pink, black and silver colour combination!